Jesus’s parable of the Good Samaritan is familiar not only in the church but general culture (as the term “Good Samaritan” implies). But many fail to understand the radical implications of the story, and what Jesus demands of his followers with his telling of it. Jesus tells this story in response to a religion scholar who wanted to know if he was doing all the right things to get eternal life. He checked the boxes of the two central commands of the Law: to love God with everything one has and to love one’s neighbor as oneself. But then he wants to make sure, or, he wants to see what is the minimum required, so he asks Jesus to define who his neighbor was. So Jesus tells the story. The critical part of the telling is the word neighbor (Greek: plesion). I was raised to think about the word in spatial terms: someone who lived next door to you, who worked in the office nearby, who sat on the plane next to you. But in the context of this story, Jesus was a Jew, talking to Jewish listeners. And for Jews, the word had a specific meaning. It meant any other person—as long as that person was also a Jew. Knowing this, I wonder if the scholar, whom Scripture says wanted to justify himself, hoped that Jesus would reinforce this specific definition, or possibly narrow it a bit. If so, Jesus disappoints him. Jesus’s story blows apart the narrow Jewish definition of who a neighbor is. He expands it to include the one group of people with which no Jew would have anything to do: the Samaritans. And on top of that, the victim (presumably a fellow Jew) is helpless and left for dead. He clearly is not calling the shots here. The people of his in-group (the priest and Levite) refuse aid; the only person who takes action and is neighbor to him (according to Jesus’s definition) is the one as far from the scholar’s interpretation of neighbor as he can imagine. Then Jesus says to go and do the same. If recent demographic trends are any indication, it will become challenging to define one’s neighbors according to a personal choice of who is “like me.” In fact, this story tells us that this option was never on the table. So, while one’s neighbor will remain, in part, associated with proximity, it is never constrained by our personal choice of comfort or compatibility. In fact, the persons one would most likely avoid might become the ones who one might need to stay alive. So are you prepared to follow Jesus’s Word, command and example? Who is your neighbor? Who is your good Samaritan? Who are the persons entirely outside your understanding of neighbor? How is the Holy Spirit telling you to learn and receive from them (“go and do likewise”)? How do you plan to make that happen? Nick Rowe works with his colleagues to create a campus climate of opportunity, leadership development and integrated student learning experiences for a student body that is increasingly diverse and global. This is so that students are prepared to provide faithful leadership and service for the common good. Nick is often looking for specific ways for students to connect what is happening inside the classroom with what is happening outside the classroom. He oversees the administration of the Multicultural Initiatives Office, the International Student Organization, first-generation students, the Office of Service Learning, campus activities, the Highland Express and the annual LEAD conference. He also serves as a secondary advisor to GCSA. 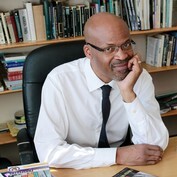 In addition, he teaches as an associate professor in the History Department and peace studies minor.